Born to wealthy and bored academic-type parents in the Cape Town area of South Africa, Gareth knew every privilege to be had as an only child. Life in the family mansion spared no luxury or expense. Due to a congenital birth defect, though, Gareth required an artificial heart at the tender age of 5. A long recovery and physiotherapy regimen left him subdued as an adolescent. Even the most lenient of physical activities proved overly exerting. With so many days and months laid up in bed, Gareth turned his mind to reading and learning. Due to his physical ailments, Gareth was schooled at his family’s estate by the finest tutors in all of Africa, and he had only been outside the manor a handful of times. It wasn’t until taking the waters of the Cape of Good Hope in the family yacht that Gareth discovered himself. Nautical study of ages past, where ship captains braved unfamiliar waters and sailors navigated by star constellations, came alive for a teenage Gareth. He knew then that Starfleet was his calling. Even with his solid test scores and family reputation, it required several waivers before the Starfleet Academy even considered his application. As a man of letters, Gareth excelled at his classes, but he struggled with physical fitness and other hands-on training. It took a dedicated physical trainer and personal physician for him to maintain the minimum standards for cadets. Gareth even began a romantic dalliance with another cadet named Gabrielle Melas, but his penchant for condescending conversations soon put an end to it. Between his physiotherapy in addition to his course track, Cadet Tau did not pursue many other relationships, platonic or otherwise. He instead found refuge in his wry sense of humor with which he insulated himself from others. By the time he graduated and received his first assignment as a junior Science office aboard the USS Tokugawa, Gareth had failed to make any sort of mark outside of his impressive GPA. The Tokugawa proved to be fertile ground for Gareth’s budding Starfleet career. Without the constant, prevailing stress of maintaining his diminished peak physical condition, Gareth was able to focus his energies entirely into his research work. The hard-nose militancy with which he approached his duties earned him an early promotion to Assistant Chief Science Officer. His theorems allowed for a personally unprecedented ability to collaborate with others — in this case, the Chief Engineer, a Lieutenant Gary Huxley. The two colleagues developed a friendship which survived Gareth’s transfer to Outpost 197. Before the Dominion War, Outpost 197 was an inconspicuous stop between larger starbases near the Demilitarized Zone. That all changed when Cardassia opened its borders to the Jem’Hadar expeditionary force and pledged their fleets to the Dominion. Gareth managed to build upon his successful starship service by upgrading 197’s sensor suites to search out cloaked vessels using triangulated communications relays to detect masked warp signatures through disruptions in the relay network. It was an imperfect method that could not be duplicated in many other locations across the quadrant, but the Tau Method was instrumental in Outpost 197 holding the line in the war. Following the Treaty of Bajor, Outpost 197 returned to its previous inauspicious history of connecting dots for starships passing through the sector. Gareth developed a touch of fame in his cross-departmental acumen, and more than once had been called a big fish in a small pond. Medical advancements provided for upgrades to his cardiac implants and circulatory system, allowing him a greater quality of life than he had ever known. He served as a full Lieutenant for several years, perfectly content to do as he pleased in his little fiefdom, until he received a transmission from Earth. His old friend Gary Huxley, now a Commander, had obtained a position with the Research & Development department of Starfleet’s Operations Center. The Ronin project had been pulled out of mothball status by Captain Isaac Smith who was compiling a pool of talent to polish its flaws into a workable class. Gareth’s proven ability to work across departmental lines to solve seemingly unfixable problems got him a first-class recommendation. Never able to resist a challenge, he eagerly accepted the offer. The Ronin Project was a resounding success. Although Gareth joined late in the process, he was nonetheless instrumental in the winning flight trials. His efforts earned him the full rank of Commander. The technological marvels turned the Ronin from a scrap heap into a solid cruiser and potential flag ship for admiralty would remain a personal mark of pride for years to come. Due to his intimate familiarity with the ship class and his stellar service record, Gareth was offered a limited command role as Mission Adviser on the USS Ronin‘s maiden voyage. It was an eventful year which catapulted Gareth into the higher echelons of the fleet hierarchy. His extensive experience with starships and stations alike garnered him a sterling offer from the commanding officer of Deep Space 5. Gareth said goodbye to Captain Smith of the Ronin and took up his new role. The years spent at Deep Space 5 were inspirational for Gareth. His wings for command spread wide beneath Captain Roslyn Graham who taught him a personal touch. By the time she entered retirement, leading to Gareth’s promotion to Captain, Gareth finally learned what it meant to be a leader of men. His time spent commanding Deep Space 5 was quiet and uneventful, with only a scant few crises marking the years served. After several years of relative peace, signs are appearing that old enemies are uniting under one banner against Federation interests. Rumors from SFI regarding the Ravagers forming an integral part of a secret Pact have risen to the offices of Task Force leadership. 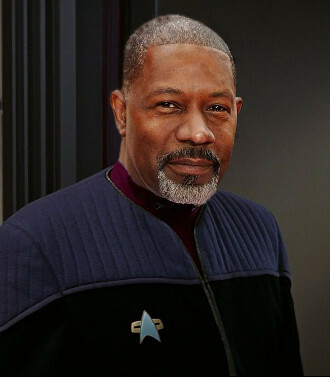 Gareth, with his extensive experience in the region, relationships with flag officers, and consummate knowledge of many cross disciplines, was made executive officer of the task force to help thwart the latest challenges faced by Starfleet.